The Answer is yes, but removing the paint from your brick fireplace can be tedious process, so make sure you really want to remove it before you get started. 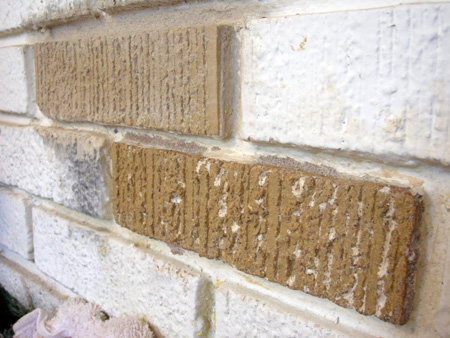 If you’re planning to paint over your brick fireplace again, you likely don’t need to remove the paint in most cases. Instead, you can just paint right over the original coat with a different color or use a product such as the Brick-Anew Paint Kit to get a “real brick” look instead of a painted look. While most red brick looks outdated, there are situations where it may make sense to keep your original brick intact. If your fireplace is made from antique brick over a hundred years old, it might be best to keep the original brick. Antique brick is beautiful on its own and should never be painted in my opinion. If you have a large amount of brick, you should consider hiring a professional since the process will require so much time and effort. If you have only a small amount of brick, you should consider doing the project yourself. Try to find some paint stripping products that don’t have such harsh fumes as some from the past. There are gel and paste compounds that are excellent for removing old paint. Fabric based peeling strips can help as well. One product I’ve seen called Strip Away looks like it can do a pretty good job. Tip: Do not attempt to sandblast the brick or apply a heavy-duty power wash to the brick since it might damage the bricks’ surface.